The 2014 Cleveland Browns season was the franchise's 66th season as a professional sports franchise and its 62nd as a member of the National Football League. It was the first under new head coach Mike Pettine, as former head coach Rob Chudzinski was fired after a 4–12 campaign, as well as the first under new general manager Ray Farmer. The Browns improved upon their overall record, going 7–9 and securing their first season without double digit losses since 2007. However, they failed to make the playoffs for the twelfth consecutive year, the longest postseason drought in franchise history. On December 29, 2013, the Browns fired head coach Rob Chudzinski. In his only season as coach, Chudzinski posted a record of 4–12, including a 7-game losing streak to end the season, although he ended the Browns' 11-game losing streak to the division rival Baltimore Ravens. Offensive coordinator Norv Turner left the team to take the same position with the Minnesota Vikings, and defensive coordinator Ray Horton took the same position with the Tennessee Titans. On January 23, 2014, the Browns hired former Buffalo Bills' defensive coordinator Mike Pettine as head coach. Pettine served as defensive coordinator of the Bills in 2013, defensive coordinator of the New York Jets from 2009–2012, and a defensive assistant with the Baltimore Ravens from 2002–2008. This will be Pettine's first opportunity as an NFL head coach. On January 27, the Browns hired former Bills' linebackers coach Jim O'Neil as defensive coordinator. O'Neil has served as a defensive assistant under Pettine with both the Jets and the Bills. Also, on January 27, the Browns filled out their defensive coaching staff by adding three assistant coaches who worked under Pettine in Buffalo: Chuck Driesbach as linebackers coach, Brian Fleury as assistant linebackers coach and Jeff Hafley as secondary coach. The Browns also hired former Tampa Bay Buccaneers' tight ends coach Brian Angelichio to the same position and retained assistant secondary coach Bobby Babich, special teams coach Chris Tabor, and assistant special teams coach Shawn Mennenga from Chudzinski's coaching staff. On February 3, the Browns hired former Washington Redskins' offensive coordinator Kyle Shanahan to take the same position with the team. Shanahan, the son of Super Bowl champion head coach Mike Shanahan, served as the Houston Texans' offensive coordinator from 2008–2009, and the Redskins' offensive coordinator from 2010–2013. On February 11, the Browns fired general manager Mike Lombardi and promoted assistant general manager Ray Farmer to take his place as GM. In addition, CEO Joe Banner resigned from his role with the team. Also on February 11, the Browns hired Bill Kuharich as assistant general manager to Farmer. Kuharich worked with Farmer in the Kansas City Chiefs player personnel department, and has also worked in the New Orleans Saints player personnel department. The Browns traded their original first-round selection (No. 4 overall) to the Buffalo Bills in exchange for the Bills' first round selection (No. 9 overall) and their 2015 first and fourth round selections. 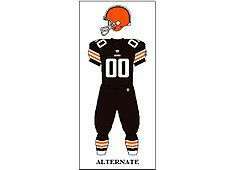 The Browns then traded the No. 9 overall selection, along with their fifth round selection (No. 145 overall) to the Minnesota Vikings in exchange for the No. 8 overall selection. The Browns acquired an additional first-round selection (No. 26 overall) in a trade that sent running back Trent Richardson to the Indianapolis Colts. The Browns traded the No. 26 selection, along with a third round selection (No. 83 overall), to the Philadelphia Eagles in exchange for the No. 22 overall selection. The Browns acquired an additional third-round selection (No. 83 overall) in a trade that sent the team's 2013 fourth-round selection to the Pittsburgh Steelers. This selection was later traded to the Eagles (see above). The Browns acquired an additional fourth-round selection (No. 127 overall) in a trade that sent the team's 2013 fifth-round selection to the Indianapolis Colts. Trading the No. 145 selection to the Minnesota Vikings (see above). Trading the No. 106 and No. 180 selections to the San Francisco 49ers in exchange for the No. 94 selection. Trading traded the No. 218 selection to the Baltimore Ravens in exchange for their sixth-round selection in the 2015 NFL Draft. On May 9, it was announced that wide receiver Josh Gordon could face a possible season-long suspension due to a fourth failed drug test. On July 4, 2014 Josh Gordon was arrested for DWI in Raleigh, NC. On August 27, the suspension was upheld after Gordon's appeal. On September 12, after the NFL and the NFLPA approved a new drug testing program, Gordon's suspension was retroactively reduced to 10 games. On November 17, his reinstatement was officially announced and he returned Week 12 at the Georgia Dome, against the Atlanta Falcons, on November 23. The Browns had no games west of the Mississippi River in 2014, by virtue of their conference rotation with the NFC South and AFC South division opponents, and common record teams, playing at FirstEnergy Stadium. Their only game outside of the Eastern Time Zone was in Nashville, Tennessee against the Tennessee Titans in Week 5. Their November 6 game in Week 10 was their only scheduled national television appearance on the NFL Network, against the Cincinnati Bengals. The Steelers dominated the first half, and the Browns trailed 27-3 at halftime. WR/PR Antonio Brown was flagged 15 yds. for unnecessary roughness on a return when he attempted to hurdle over P Spencer Lanning, kicking him in the face; no fine, ejection, or other sanctions were imposed. However, the Browns scored 24 straight points in the second half to tie the game at 27-27. Unfortunately, the comeback attempt fell short as Steelers K Shaun Suisham kicked a 41-yard game-winning field goal as time expired. With the loss, the Browns lost their tenth straight season opener, setting an NFL record. It was also their eleventh consecutive road loss to the Steelers. This was the Browns' first home opener win since 2004, and also marked Johnny Manziel's NFL debut. The defense, primarily by rotating DB's Tashaun Gipson, Buster Skrine, rookie Justin Gilbert and Joe Haden, were able to neutralize TE Jimmy Graham and QB Drew Brees for almost the entire first half; Graham eventually finished with 118 yds. and 2 TD's. Rookie Terrence West, who had 2500+ all-purpose yards at Division II-school Towson Univ., ran for almost 70 yards and one TD. Billy Cundiff hit the game-winning FG as time expired. For the Browns, this would mark the third straight regular season game that they played in: that would be decided by 3 or fewer points, and that would have a game winning field goal in the final ten seconds of the fourth quarter. In a tightly contested match, the Browns led 21-17 heading into the fourth. A series of errors (including a missed 50 yard field goal try and a blocked field goal attempt) prevented them from scoring, while the Ravens scored 6 unanswered. Throughout the first three periods, the Browns were 5/7 on third down conversions; they were 0/4 on third down conversions and gained only one first down in the decisive fourth quarter. Ravens K Justin Tucker kicked the game-winning field goal as time expired. With the loss, the Browns suffered their first home loss of the season as their record fell to 1-2 entering the bye week. The Browns also fell to 1-12 against the Ravens with Joe Flacco as the QB under center. Victories by the Bengals and the Steelers would leave the Browns in sole possession of last place in the AFC North. The Browns were the only team in the NFL not to have a turnover in the first three games of the season. This marked the Browns' only game outside of the Eastern time zone during the 2014 season. The Browns ended a 7-game away losing streak and improved to 2-2 with the win. For the fourth time this season, the Browns participated in a game that was decided by 3 or fewer points. It was also the fourth time in as many games that the winning score was produced with less than 2 minutes to go in the 4th quarter. The game was aggressive, with 14 penalties for 142 yards, and the ejection of the Titans' linebacker Derrick Morgan. The Titans dominated in the early minutes, scoring the first 14 points of the contest and leaping out to a 28-3 lead. Despite trailing by as many as 25 points in the second quarter, the Browns scored the final 26 points of the game while the Titans failed to score any points in the second half. Travis Benjamin caught the game-winning TD pass from Brian Hoyer with 69 seconds left in the game. The Browns' 25 point rally represented the largest comeback in franchise history and the largest comeback by a road team in NFL history. For his outstanding play on punt and kick coverage, Browns DL Tank Carder was recognized as the AFC Special Teams Player of the Week. This was the second and final regular season meeting between the two teams. The Browns snapped a four-game losing streak to the Steelers in a 31-10 blowout victory. They also won their first divisional game of the season, ending a five-game losing streak to division foes. The Steelers led 3-0 after the first quarter. However, the Browns scored 21 straight points in the second quarter, building a 21-3 halftime lead. Adding a field goal in the third quarter and a touchdown in the fourth, the Dawgs created an insurmountable 31-3 lead. The Steelers' late touchdown in the fourth quarter produced the final score. Steelers' QB Ben Roethlisberger suffered only his second career loss in 20 career games against the Browns. For Cleveland, the 21 point margin of victory was the most lopsided win over Pittsburgh since they routed them 51-0 in a Week 1 matchup during the 1989 season. The Browns moved into third place in the AFC North with a 3-2 record while the Steelers fell into fourth place with a 3-3 record. Through five games this season, the Browns have committed only 2 turnovers while forcing at least one turnover in four of their five games this season. Center Alex Mack would be out for the rest of the season with a knee injury. Claimed on waivers during the summer, he is replaced by Nick McDonald. The Browns entered this game with a 3-2 record, coming off a blowout victory over the Steelers and were looking to win their third consecutive game. Meanwhile, the Jaguars entered with a 0-6 record, and a 9-game losing streak, coming off a tough loss to the Tennessee Titans. Despite being heavy favorites to win this matchup, the Browns were routed 24-6. The Browns led 6-0 late in the first half and had the opportunity to kick a field goal and go up 9-0. Instead, Browns HC Mike Pettine opted to go for it on 4th & 1. The conversion attempt failed, and within seconds, the Jaguars scored a touchdown to close out the half, leading 7-6. Following a lost fumble by Brian Hoyer, the Jaguars added a field goal to make it 10-6. In the fourth, the Browns finally imploded. KR Jordan Poyer attempted to catch the punt at the Browns' 2 yard line; the ball went off his facemask, and the Jaguars recovered, scoring a touchdown on their next drive to make it 17-6. On the Browns' next drive, Hoyer threw an interception and the Jags converted another touchdown a few seconds later, making the final score 24-6. After committing only 2 turnovers in their first 5 games, the Browns committed 3 turnovers against the Jaguars. 17 of the Jaguars' 24 points came off turnovers. The defense picked off Blake Bortles three times, but they were able to score only 3 points off of those turnovers. Hoyer struggled mightily throughout the game, going 16/41 for 215 yards, 0 touchdowns, an interception, and a lost fumble. It was the Browns' lowest scoring output of the season and the fewest points that they had scored with Hoyer as their starting quarterback. It was the first time that the Browns had failed to score a touchdown in a game since Week 2 against the Ravens (in the 2013 season). It was also the first time that the Browns failed to score any points in the second half (it last occurred in Week 2 of the 2013 season when the Browns were outscored by the Ravens 14-0 in the second half). The Jaguars won their first game of the season to improve to 1-6; The Browns' record dropped to 3-3 as they fell to 4th place in the AFC North. After suffering a disappointing loss to the previously winless Jaguars the week before, the Browns faced yet another winless opponent in the Oakland Raiders. Both teams struggled for much of the game, kicking a combined five field goals as the Browns held a 9-6 second half lead. At the end of the third quarter the Browns finally got the break they needed when S Joe Haden recovered a Darren McFadden fumble deep in Cleveland territory and returned it 34 yards. Four plays later, QB Brian Hoyer found WR Andrew Hawkins for a four-yard touchdown pass and a 16-6 lead. The Raiders would never recover and the Browns, despite giving up the Raiders' lone TD pass from Derek Carr to Andre Holmes with 7 seconds left, won the game 23-13. TE Jordan Cameron suffered a concussion and is expected to be out at least 1 week per NFL rules regarding protocol for head-contact impact. The "soft schedule" run ends with the last of three teams combined to have 2 wins during the season. Rookie WR Mike Evans, a teammate of Johnny Manziel at Texas A&M and the recipient of more than 200 catches in 2 years, was the favorite target for QB Mike Glennon, scoring both of Tampa Bay's TD's in the game. Patrick Murray added a field goal but missed three others. Cleveland played like the #3-ranked defense in the AFC, blocking Murray's first FG attempt, tipping a punt that gained only 12 yards, getting 2 INT's and a fumble, and keeping the Bucs out of the end zone in the fourth quarter. QB Brian Hoyer passed for 300 yds but threw 2 picks along with two scores, with the game-winner to rookie wide receiver Taylor Gabriel. A very anemic running game netted less than 100 yds, underscoring the loss of C Alex Mack. This was the 82nd meeting between the teams in the "Battle of Ohio." The Browns' defense suffocated the Bengals, forcing four turnovers while limiting the Bengals' offense to 3 points and surrendering only one red zone drive. Bengals QB Andy Dalton struggled severely, going 10/33 for 86 yards while throwing 3 interceptions, and being sacked twice on consecutive plays by DT Desmond Bryant. His final passer rating was 2.0, the lowest in Bengals team history. Cleveland found its sea legs using the "running back by committee" approach, with all three of its starting rushers (Ben Tate, Terrence West, and Isiah Crowell) scoring TD's in compiling 170 yds on the ground. The Bengals lost their first regular season home game since Week 14 of the 2012 season (against the Cowboys). The 21-point loss represented the Bengals' most lopsided defeat since the Ravens routed them by 31 points in Week 13 of the 2008 season. For the Browns, their 21-point victory marked their largest road margin since the 1993 season (when the Browns beat the L.A. Rams by 28 points), won multiple road games in a season for the first time since 2010, snapped a 5-game road losing streak to the Bengals and a 17-game road losing streak to division foes (both of which began in 2008). The Browns' 6-3 record is the franchise's best 9-game start since returning to the league in 1999, and their best start since the 1994 season when the Browns opened the season with a 7-2 record. With the convincing win on Thursday night in front of a national audience, and after a Steelers loss on Sunday, the Browns held sole possession of first place in the AFC North, the first time the Browns solely led a division since 1995. TE Jordan Cameron missed his second week of action due to a concussion. The Browns' defense has kept their opponents out of the end zone for 5 straight quarters. DB Tashaun Gipson, who the leads the league with 6 INT's, also has a concussion; his status for the next game is uncertain. This marked the first of four games against potential playoff-bound teams in the Texans, Atlanta Falcons, Buffalo Bills, and Indianapolis Colts. The Browns saw their three-game winning streak end as the Texans' defense and run game dominated the Browns in a 23-7 blowout loss. Texans DE J.J. Watt, who played tight end in high school, scored the 5th offensive TD of his career. The Browns' lone score came in the 2nd quarter. A touchdown from Brian Hoyer to Browns' receiver Andrew Hawkins tied the game at 7 in the second quarter. However, the Texans scored the final 16 points of the contest. Hoyer struggled as he was 20/50 passing for 330 yards, throwing only one touchdown while throwing a 4th quarter interception. It was only the second time this season that the Browns got shut out in the second half of a game, an event that also occurred in their 24-6 loss to the Jaguars. With the loss, the Browns fell out of 1st place in the AFC North and into a tie for 3rd place behind the Bengals and Steelers, who both won that week. Defensive linemen John Hughes and Phil Taylor were lost for the season on IR, and Jordan Cameron missed his 3rd straight game due to a concussion. On November 18, the Browns released RB Ben Tate. This was Josh Gordon's first action, back from his 10-game suspension. He led all receivers with 120 total yards. Down 24-23 with 44 seconds left, Hoyer, who had 3 interceptions and 0 touchdowns, drove the ball 61 yards including the key pass to Gordon inside the 35 yard line, setting up Billy Cundiff's 2nd game-winning field goal of the season with 5 seconds left for a 26-24 victory. (Ironically, this was exactly the same score as his other GW FG against the Saints in Week 2.) The Browns won consecutive road games for the first time since 2008, and Hoyer became the first Browns quarterback since Brian Sipe in 1980 to record consecutive 300+ yd games. S Tashaun Gipson left the game in the fourth quarter after colliding with CB Joe Haden and suffering a serious knee injury on the play. Gipson would miss the rest of the regular season. The Bills' defense dominated the Browns in a 26-10 defeat. The first half was low scoring; K Billy Cundiff made a 22-yard field goal for a 3-0 lead. Several special teams errors occurred in the second quarter that prevented either team from scoring. Cundiff missed a field goal and the Bills' K Dan Carpenter's 53 yard field goal try was blocked by S Joe Haden. The Bills dominated the second half, scoring 20 unanswered points to seize control. The Bills scored a touchdown early in the third to go up 7-3. On the Browns' next drive, RB Terrance West fumbled, and the Bills recovered for a touchdown, adding a field goal in the 4th quarter to make it 17-3. Hoyer threw an INT on the next drive, and the Bills kicked another field goal, building a 20-3 lead. At that moment, Hoyer was benched for Johnny Manziel for the remainder of the game. Manziel led an 80-yard touchdown drive on his first series, running for a touchdown to cut the deficit to 20-10. On Manziel's second drive, the Browns failed to gain a first down, turning the ball over on downs. The Bills kicked 2 more field goals to make it 26-10, producing the final margin. With the loss, the Browns fell to 7-5, still in 4th place in the AFC North (due to tiebreakers). For Hoyer, this was the second consecutive game where he had 0 passing touchdowns and multiple interceptions. It was the Browns' first loss this season when holding a lead after the first half. The 26 points allowed by the Browns in the second half were the most points that they had surrendered in the second half of any game this season. Following the game, Browns coach Mike Pettine announced that he was uncertain who would start at QB against the Indianapolis Colts, but he would decide by Wednesday. WR Miles Austin was hospitalized at the end of the game for a kidney injury sustained from a helmet-leading tackle in the 2nd quarter. He was later ruled out for the remainder of the season. On December 3, Pettine announced that Hoyer would start against the Colts. The Colts rallied from a 14-point deficit in the second half to knock off the Browns, 25-24. The defense got off to a fast start right away and dominated for 59 minutes, forcing 4 turnovers in the contest. QB Andrew Luck fumbled on the Colts' 1 yard line, and the ball was recovered in the endzone to make it 7-0. With a chance to go up 10-0, Browns K Billy Cundiff missed a 40 yd. field goal that would later prove to be very costly. Following the miss, Luck rushed for a TD to tie the game at 7-7. On the next drive, Hoyer led the Browns downfield; Rookie RB Isaiah Crowell ran in for a touchdown to lead 14-7 at halftime. In the second half, the Colts' turnover problems continued, committing a fumble on their first drive that the Browns couldn't convert into points. Later in the quarter, Luck threw a "pick-six" to Browns rookie DB Justin Gilbert (his 1st INT of the year), and the Browns went up 21-7. The next two Colts' drives resulted in points (a field goal and a T.Y. Hilton touchdown), cutting the deficit to 21-16 heading into the 4th quarter. Adding another FG in the 4th to make it 21-19, and with a chance to take the lead, Luck threw another interception (he was sacked 3 times). However, the Browns failed to get a first down and were forced to settle for 3, making it 24-19 Browns and leaving the door open for the Colts to take the lead. With less than 4 minutes to go, Luck led a 90-yard game-winning touchdown drive. The Browns had a chance to end the game with a stop on 4th and inches at the 3 yard line, but RB Dan Herron avoided the tackle and picked up 2 yards for a Colts first down. Luck would throw the game-winning TD pass to Hilton on the next play, making it 25-24 Colts with 36 seconds left. After a failed two point conversion, and with the Browns having one more chance to win the game, Hoyer threw his 2nd INT with less than 10 seconds remaining, and the Colts ran out the clock. The Browns' offense was barely noticeable throughout the contest. TE Jordan Cameron returned to duty after 5 weeks, leading all Browns receivers with only 41 yds. 17 of the teams' 24 points came off of Colts turnovers, the defense converting two into TD's. Punt and kick coverage teams kept returning fan-favorite KR Joshua Cribbs in check, and traded RB Trent Richardson was held to 30 yds. on 7 carries. MLB D'Qwell Jackson had 9 tackles for Indy, but no sacks. In the second half, the Browns' offense failed to convert a single 3rd down (0/6). For the fourth consecutive game, Hoyer was dismal, passing 14/31 for 140 yards, 0 TD's, and 2 INT's (the third straight game that Hoyer had 0 TD's and multiple INT's). It was the second game in a row that the Browns failed to win after holding a halftime lead. It was only the second time that the Browns lost when holding a 4th quarter lead at any point (the other loss coming to the Ravens in Week 3). After starting 6-3, the Browns are 1-3 in their last 4 games. The Browns' offense scored 26 points in their one victory while all 3 losses featured the offense scoring 10 or fewer points. The Browns fell to 7-6 on the season; wins by the Steelers and Ravens would leave the Browns in sole possession of 4th place in the AFC North. It was the first time this season that the Browns lost back-to-back games, and consecutive home games. The Browns also lost their ninth consecutive December game, a drought that goes back to Week 15 of the 2012 season. A loss in Week 15 to the Bengals (8-4-1) would eliminate the Browns (7-6) from contention for the AFC North title and possibly the postseason. On Tuesday, it was announced that Johnny Manziel would start over the struggling Brian Hoyer. Starting G Ryan Seymour moved to center, replacing Nick McDonald as the team's 4th center to start a game. He is expected to finish the season at that position. K Billy Cundiff was released from the team on December 13, replaced by K Garrett Hartley. This was the second and final regular season meeting between the two teams. The Browns, having won the first meeting in Cincinnati, were looking to sweep the season series for the first time since the 2002 season. However, the Bengals throttled the Browns in a 30-0 defeat, dominating from start to finish. The Bengals pounced on the Browns early, scoring a touchdown on their opening drive. They went up 20-0 in the first half and never looked back. Manziel was awful in his first start for the Browns, going 10/18 for 80 yards, 0 touchdowns, and 2 interceptions. The Browns' 38 offensive plays were the lowest in the NFL this season. The Browns were shut out in a game for the first time since Week 10 against the Ravens in the 2009 season. The 30 point margin of defeat was the Browns' most lopsided loss since they were routed by 32 points (41-9) in a home game against the Steelers in Week 17 of the 2010 season. It was the most lopsided loss for the Browns in the Browns-Bengals rivalry since they were routed 30-0 by the Bengals in Week 11 of the 2006 season. And it also was the largest margin of defeat in a home shutout this season. The Browns extended their losing streak in December games, having lost 10 consecutive games. Their last win in a December game came in Week 14 of the 2012 season against the Chiefs. The Browns were only the second team to get shutout at home this season (Redskins lost 24-0 to the Rams at home in Week 14). With the loss, the Browns dropped their third consecutive game as they fell to 7-7 on the season (4-4 at home), remained in 4th place in the AFC North, and were mathematically eliminated from AFC North title contention. The Browns have now gone 22 consecutive seasons without a division title, the longest active drought in the league. After a 6-3 start, they went 1-4 in their last five games, including an 0-3 record in their last three home games. It was the fourth time in five games that the offense failed to score more than 10 points. On Saturday, December 20, the Chargers defeated the 49ers on the road, rallying from a 21-point 3rd quarter deficit to win 38-35 in overtime. With the Chargers' victory, the Browns were mathematically eliminated from postseason contention. The Browns were largely done in by their inability to win tiebreakers. They lost conference tiebreakers to both the Steelers and Chargers, who are guaranteed to finish with at least 9 wins and at least 6 conference victories. By comparison, the Browns had a 4-7 conference record and could finish with no more than 9 wins and 5 conference victories. The Browns have now gone twelve straight seasons without a playoff berth, the longest drought in franchise history. Having been eliminated from postseason contention, the Browns entered this game playing for pride and looking to sweep the NFC South. In a low scoring first half, the Panthers jumped out to a 10-3 lead. QB Johnny Manziel got off to another slow start, going 3 for 8 with only 32 passing yards. The Browns gained only 2 first downs with Manziel in the first half (with one first down coming via penalty). With less than two minutes remaining in the first half, Manziel injured his hamstring, and was ruled out for the rest of the game. In the third quarter, the Browns added a field goal from newly signed K Garrett Hartley, cutting the deficit to 10-6. In the fourth quarter, Hoyer threw an 81-yard TD pass to TE Jordan Cameron, and the Browns led 13-10. However, the Panthers would score the go-ahead touchdown on their next drive and go up 17-13. With the Browns facing a 4th and 11 at midfield, HC Mike Pettine elected to punt. The Browns' defense couldn't force a punt or turnover, and the Panthers ran out the clock. With the loss, the Browns lost their fourth straight game as their record dropped to 7-8 and guaranteed a finish in fourth place in the AFC North. The Browns have lost 11 consecutive December games going back to Week 15 of the 2012 season. The Browns have now gone seven consecutive seasons without a winning record. Since the franchise returned to the NFL in 1999, the Browns have finished without a winning record 14 of the last 16 years. The AFC North division went 11 straight weeks with all teams having winning records, and 12 of 16 weeks above .500, best in the league since 2008. On December 23, Pro Bowl selections were announced for the season: DB's Tashaun Gipson and Joe Haden are on the starting roster, along with OT Joe Thomas, his 8th straight trip and the first offensive lineman in NFL history to be nominated in each of his first 8 seasons, passing the great Lou Groza and second only to the legendary Jim Brown for the team's all-time nomination record. On December 24, QB Johnny Manziel was placed on IR; practice squad QB Connor Shaw is taking first-team reps, and Tyler Thigpen was signed to a temporary contract. On December 26, due to injuries to both Hoyer and Manziel, Connor Shaw was announced to be the starting quarterback for the Browns' Week 17 matchup against the Ravens. On December 27, Browns' WR Josh Gordon was suspended for the season finale for a violation of team rules. He will be the first player to lead the NFL in receiving and then fail to score a touchdown the following season since Raymond Berry in 1961. In the season finale against the former team from Cleveland, undrafted rookie QB Connor Shaw started the game as the teams' 3rd QB for the season. Defensive and Kicking units kept the game close, as both offenses were disrupted for the entire first half; K's Justin Tucker and Garrett Hartley scored field goals for a 3-3 tie. In the third quarter, the Browns got key plays from Shaw and rookie RB Terrence West, as he scored on a 2-yard run to take the lead 10-3. Because of the amount of plays on the field for the defense, however, they ran out of gas in the fourth, and QB Joe Flacco led Baltimore to 17 straight unanswered points, including a pair of passing TD's to Kamar Aiken and Torrey Smith, for the Ravens' 20-10 win. By virtue of the San Diego Chargers' loss to the Kansas City Chiefs, the Ravens became the third team in the AFC North to earn a playoff spot. The Browns fell short of doubling their win total from the previous season, ending with a five-game losing streak, and ranking 12th in the Conference (see below.) The Browns also extended their losing streak in December games to 12. Secondary and coverage unit specialist Jim Leonhard announced that he will retire after a 10-year playing career in the NFL. By virtue of the Buffalo Bills' record for the trade that sends their first-round pick to Cleveland, the Browns have the #12 and #19 picks in Round 1 of the 2015 NFL Draft. They also get an additional pick from the Bills in Round 4, and a conditional 6th-rounder from Baltimore. Rounds 2 & 3 give them picks #43 & #77, respectively. On January 3, 2015, T Joe Thomas was named to the Associated Press’ 2014 NFL All-Pro team for the fifth time. On January 12, the Pro Football Writers' Assn. named Thomas to the All-NFL team while G Joel Bitonio joined Thomas on the All-AFC team. Bitonio joined the Baltimore Ravens LB C.J. Moseley as the only two rookies on the squad. On January 19, due to Seattle Seahawks S Earl Thomas' advancement to Super Bowl XLIX, Browns S Donte Whitner was added to the Pro Bowl roster, his 3rd career nomination. Cleveland joins Seattle and Denver in becoming the only three teams to have at least three members of their secondary to earn Pro Bowl honors. Team rosters were selected by NFL legends Cris Carter and Michael Irvin, therefore the slot was filled without regard to either conference. CB Joe Haden was named a captain of one of the Pro Bowl rosters alongside RB DeMarco Murray of Dallas on January 15. DE J.J. Watt of Houston and WR Antonio Brown of Pittsburgh were named opposite roster captains. The Browns' Week 5, 25-point comeback win at the Tennessee Titans was selected as a finalist for the GMC "Never Say Never" moment of 2014. The winner was the Green Bay Packers Week 6 win over the Miami Dolphins, announced on February 6. On January 28, Joe Haden was named a Global Ambassador for the Special Olympics. He’s the first American professional football player to ever hold the title, joining celebrity athletes gymnast Nadia Comaneci, figure skater Scott Hamilton, golfer Padraig Harrington, NBA stars Yao Ming and Dikembe Mutombo, speed skater Apolo Anton Ohno, and swimmer Michael Phelps. 1 2 3 "Browns hire Jim O'Neil as new DC". Associated Press. January 27, 2014. Retrieved January 28, 2014. ↑ "Browns name Ray Farmer new GM". Associated Press. February 11, 2014. Retrieved February 11, 2014. ↑ Benne, John (February 11, 2014). "Browns hire Bill Kuharich as assistant GM". SB Nation. Retrieved February 12, 2014. ↑ Howell, Leo (March 16, 2014). "Tampa Bay Buccaneers Add More Depth at Guard, Sign Oniel Cousins". The Pewter Plank. Retrieved March 18, 2014. ↑ Breech, John (March 6, 2014). "Browns re-sign kicker Billy Cundiff to one-year deal". CBS Sports. Retrieved March 18, 2014. ↑ Jones, Mike (March 11, 2014). "Redskins free agency, Day 1: Riley, Moss back, WR Roberts, G Lauvao and LB Hayward added". Washington Post. Retrieved March 18, 2014. ↑ "Browns Tender COntract to LB Robertson". Bleacher Report. March 6, 2014. Retrieved March 18, 2014. ↑ Neisen, Joan (March 12, 2014). "Broncos invest in their defense with three pricey signings". Sports Illustrated. Retrieved March 19, 2014. ↑ Wesseling, Chris (March 5, 2014). "Davonne bess among three cut by Browns". NFL.com. Retrieved March 19, 2014. 1 2 Wilson, Ryan (March 12, 2014). "Browns Release QBs Brandon Weeden and Jason Campbell". CBS Sports. Retrieved March 19, 2014. ↑ "Bengals sign QB Jason Campbell to be backup". The Sporting News. March 20, 2014. Retrieved March 25, 2014. ↑ Brinson, Will (February 26, 2014). "Browns Release LB D'Qwell Jackson". CBS Sports. Retrieved March 19, 2014. ↑ Wilson, Ryan (March 6, 2014). "Colts Sign LB D'Qwell Jacosno". CBS Sports. Retrieved March 19, 2014. ↑ Edholm, Eric (May 16, 2014). "Browns release Greg Little, making that Julio Jones trade look even worse now". Yahoo Sports. Retrieved May 16, 2014. ↑ Gutierrez, Paul (May 19, 2014). "How does Greg Little fit with Raiders". ESPN. Retrieved May 20, 2014. ↑ Sabin, Rainer (March 17, 2014). "Dallas Cowboys sign QB Brandon Weeden". Dallas Morning News. Retrieved March 19, 2014. ↑ Chris Pokorny (May 19, 2014). "Browns Sign WR Anthony Armstrong & Waive WR Josh Cooper; Other Transactions". SBNation. Retrieved May 19, 2014. 1 2 Pat McManamon (May 15, 2014). "Browns add WRs Austin, Bennett". ESPN. Retrieved May 15, 2014. ↑ Rothstein, Michael (April 6, 2014). "WR Nate Burleson to join Browns". ESPN. Retrieved April 10, 2014. 1 2 "Browns add DL Dansby, S Whitner". ESPN. March 11, 2014. Retrieved March 18, 2014. 1 2 3 "Browns sign Zac Diles, Tyler Thigpen, Vince Young". ClevelandBrowns.com. May 1, 2014. Retrieved May 16, 2014. ↑ Carucci, Vic (March 14, 2014). "Cleveland Browns Add Solid Blocker in TE Jim Dray". ClevelandBrowns.com. Retrieved March 18, 2014. ↑ Cabot, Mary Kay (March 18, 2014). "Cleveland Browns Swipe WR Andrew Hawkins from Cincinnati Bengals". Cleveland Plain Dealer. Retrieved March 18, 2014. ↑ Blount, Terry (March 24, 2014). "Paul McQuistan to join Cleveland Browns". ESPN. Retrieved March 25, 2014. ↑ Gantt, Darin (April 14, 2014). "Browns signing former Bengals fullback Chris Pressley". NBC Sports. Retrieved April 14, 2014. ↑ "Browns sign free agent RB Ben Tate". Associated Press. March 15, 2014. Retrieved March 18, 2014. ↑ Carucci, Vic (March 11, 2014). "Cleveland Browns add special-teams ace Isaiah Trufant". CleveladnBrowns.com. Retrieved March 18, 2014. ↑ Quinn, T. J. and Don Van Natta Jr. (May 9, 2014). "Josh Gordon faces suspension". ESPN. Retrieved May 9, 2014. ↑ "Josh Gordon suspended for season". ESPN. August 27, 2014. Retrieved August 27, 2014. ↑ "Josh Gordon suspension reduced". ESPN. September 12, 2014. Retrieved September 12, 2014.